I used Whisper White cardstock today ... a change from my usual of glossy white. I really like the mat finish on this card. This would make a great Christmas card ... but it's a little early to start those! :) Hope you like. I inked the trees (and trunks) with the Versamark Pen (avoiding the "hills" at the bottom of the trees) and stamped on the smaller piece of Whisper White. 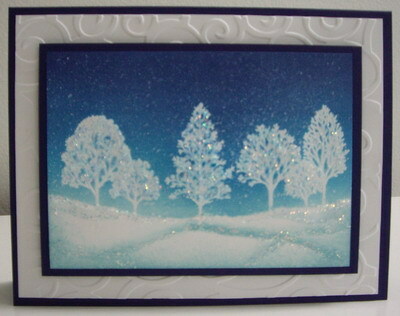 I then embossed the image with white embossing powder. I found the cardstock warped a little with the heat, so I used quite a bit of temporary adhesive to attach it to my scratch paper before I started brayering. I wanted it have a smooth, wrinkle-free surface in which to brayer. Next, I ripped a mask from a post-it note for the horizon (snow) line and placed it at the bottom of the tree trunks. I started from the top, brayering first Baja Breeze and taking it right down to the mask. Next I brayered Pacific Point on top, making sure to not completely cover the Baja Breeze. Night of Navy was brayered on top, making sure to not completely cover the Pacific Point. I used a small sponge and Baja Breeze ink to add a darker line right at the masking edge. I took a cloth (or you could use paper towel) and wiped off the trees ... blue ink from the brayering will sit on top of the embossed surface so it needs to be wiped off before proceeding. I removed the mask and then ripped a few more masks with scratch paper. I used those to created the hills in the snow, sponging Baja Breeze along the edges. I removed all masks. I took a toothbrush and wet it with water, swiped it across my white ink pad and then sprayed it with a little more water. I then used my thumb to "flick" white drops of ink all over the scene so it looks like it is snowing. The wetter the ink on the toothbrush, the larger the drops of ink. I used my heat tool to dry the image and then cropped it to 4 1/4" x 3". I ran the larger piece of Whisper White through my Big Shot with the Swirls embossing folder. I used sticky strips to attach it to the card base. I also used sticky strips to attach the main image to the frame of Night of Navy ... the paper was still a little warped (adding the wet drops of ink also increases the chances of that happening) ... so adding sticky strips along all four sides helps to smooth out the image and keep it flat. I used dimensionals to add the framed image to the card. 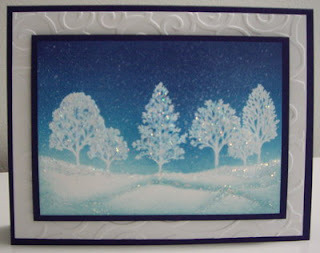 Last I used a small paintbrush to add stickles all over the trees and along the tops of the snow "hills". Labels: all occasion, brayering, dry embossing, emboss resist, Stampin' Up!